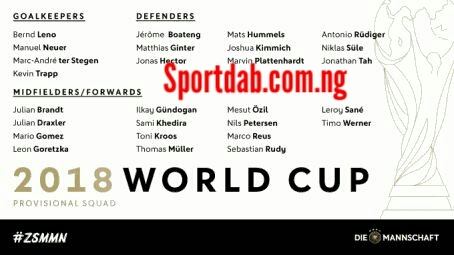 2014 World Cup Champions Germany have officially announced the preliminary squad for the 2018 World Cup in Russia. 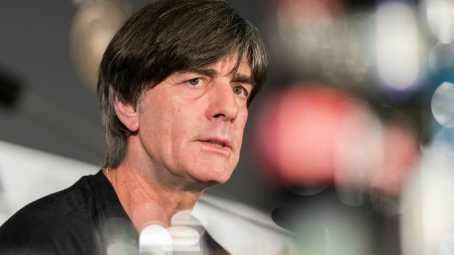 The Squad released by Coach Joachim Löw after signing a new contract extension until 2022 is made up of four goalkeepers, nine defenders, and 14 midfielders/forwards. Goalkeepers: Bernand Leno (Bayern Leverkusen), Manuel Neuer (Bayern Munich), Kevin Trapp (PSG) and Marc Andre Ter Stergen (Barcelona). Defenders: Jerome Boateng, Mathias Ginter, Jonathan Tah, Niklas Sule, Antonio Rudiger, Joshua Kimmich, Mats Hummels, Jonas Hector, Marvin Plattenhardt. Midfielders: Leon Georezka, Mesut Ozil, Leroy Sane, Toni Kroos, Ikay Gundogan, Sami Khedira, Sebastian Rudy And Julian Brandt. Forwards: Timo Werner, Thomas Muller, Julian Draxler, Nils Petersen, Mario Gomez, Marco Reus.